I had the pleasure of working with Sister Jean at St. Gregory’s in various ministries. She was a joy to be around and so full of love and passion for our faith. I know she will continue to watch over us as an angel of love. She will be missed and always be remembered by me as as a very special caring, devoted sister who loved our Lord . Rest In Peace Sister Jean. Thank you for your devotion and love. I am honored to share the blessing of my friendship with Sister Jean. I met Sister almost 20 years ago at St. Gregory the Great Catholic Church as she interviewed me and my husband George, as new parishioner’s eager to become part of the St. Gregory family. From the moment we met, we became friends and I knew that Sister Jean would be a big part of our lives forever. Sister Jean was self-less. She was kind, caring and incredibly intelligent. She gave so much to so many and we all benefited from her kindness and love. Sister Jean comforted me during difficult times, celebrated with me during happy times and gave me the confidence to strive to be the best that I could be both personally and professionally. I especially loved seeing her at the opening night performances of Broadway shows in Fort Lauderdale. From the minute I saw her, she would light up and we would spend time catching up – she would be laser focused as I updated her on my son’s progress as a pilot, my grandchildren, my daughter, my husband and of course…on me. I could see how proud she was as I told her about my travels and my accomplishments. As she hurried to make sure she was in her seat before the curtain went up, she would lean in and give me an enormous hug – as many of you know, a hug from Sister Jean was filled with strength and love and it fueled me to always want to make her proud! We continued to talk weekly after she moved to Michigan and I did my best to provide her with the comfort and motivation that she always gave me. Thank you Sister Jean for bringing out the best in me, and for caring about me and my family in ways that only a true friend, and loving family member could. I will always cherish our time together. I am grateful that God blessed me with your friendship – it means more than I could ever express. I met Sister Jean, when I registered as a member of the Parish in 2014. At that time I volunteered to become and Usher. Sister Jean always had a good word for me every Saturday. I met Sister Jean when I registered as a member of St. Gregory the Great Parish in 2014, and I volunteered to welcome parishioners and usher at the 4:00 pm Mass. Sister Jean will always have a good word to say to me every Saturday. Nor will the flame burn you". You are in God's hand now. genuine and heartfelt. I personally felt great respect and admiration for how she handled and accepted life’s challenges. Rest In Peace gentle friend. I met Sister Jean late in 1980 when we were transferred to Miami, bought a house in Miami Shores, and decided to enroll our children in Saint Rose of Lima school where she was principal. Right from the start she struck me as being extremely loving, warm, and easy to talk to. To my sadness Sr Jean only remained principal for the first year that my children were at St Rose School. But then I learned she had not left - she was in parish ministry instead. In 1981 we were invited to a neighborhood meeting officiated by Sister Jean where she was trying to get to know people in the parish. My husband George and I had a chance to speak with her at length and both of us liked her very much. Very soon Sr Jean had recruited us into parish ministry and parish activities. Even though George had graduated from Georgetown and I had graduated from Catholic University, we had moved away to some extent from the Church . We wanted our children to receive a Catholic education but we ourselves have gone through the upheaval of the Vatican Council and we’re not sure where we stood with the Catholic Church. I have to say that Sister Jean’s out reach to us brought us back into the fold - mainly thanks to her warmth and non-judgment. Before we knew it we were completely involved in parish ministry at Saint Rose. Beyond that SrJean became a close personal friend. She helped me plan a pilgrimage to the Holy Land in 1984 - because I was a travel agent at the time. That was just one of many highlights that I have in my memory bank with Sister Jean. She remained close to our family for the next 25 years, attending children’s weddings and baptisms and just being there at all the important moments. It is hard for me to summarize the impact that Sister Jean had on our lives. Through her goodness, her kindness, her non-judge mental way of leading us to God, Sister Jean was a true spiritual light in our lives. We mourn her loss and her passing. We were blessed to have been able to call her our dear Friend. 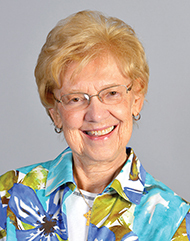 Little things make an impact on someone’s life—Sister Jean was good at that... Her smile and the rub on your back were Famous!!!! The first 2 months at St. Gregory’s Catholic Church 26 yrs ago—that’s how she welcome us -a young family recently moved to the area with no friends or family—- and we knew we were HOME!!! May the Lord be Smiling upon you, Soster Jean!! A beautiful heart. Sister Jean is with the Father. At peace.